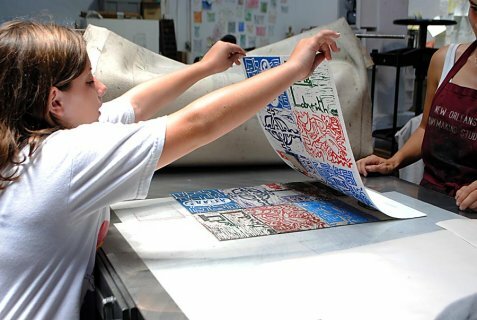 New Orleans Artworks - School of Glassworks and Printmaking Studio offers an extended summer camp for young people ages 9 -17 years old. The program features the unique chance to design and creative multi-media creations in glass, metal and print. Returning students can continue to progress. It's held Artworks/Glassworks/Printmaking School & Studio on Magazine St. in the Warehouse District. The Ogden Museum of Southern Art, one of several New Orleans museums on Camp Street downtown offers a summer camp for second through fifth grade. The camp features basic art and performance skills, as well as an original multi-act play.The New Orleans Museum of Art, aka NOMA, in City Park offers morning "In the Studio" summer camps, which focus on the visual arts, and afternoon "On the Stage" summer camp which will feature theater, creative writing, photography and puppetry. The camps are offered in two age groups. Each session has a different focus and different activities. Campers can sign up for just Studio morning class, just Stage afternoon class, or both for an all day experience. The Louisiana Children's Museum in New Orleans' Warehouse District offers several week-long camps for ages 5-8 years old. Each camp has a different themes that include art, music, puppet theater, space, science, the Wild West, etc.The Contemporary Arts Center, aka the CAC, is in the midst of the Warehouse District museums downtown. Each year the CAC hosts the Emeril Lagasse Foundation's Summer Arts Camp. That's a non-profit started by the famous chef of several top New Orleans restaurants. What to Do in New Orleans in the Summer. New Orleans has beautiful parks and City Park especially offers all kinds of activities and venues well beyond your average park. Here's a list of articles, websites, events, activities, information and ideas about what to do in New Orleans in the summer. There are lots of opportunities for fun both in air-conditioned venues and out in the sun or even better, the shade.